People love to rail against avocado toast, but you know what, avocado toast is delicious. 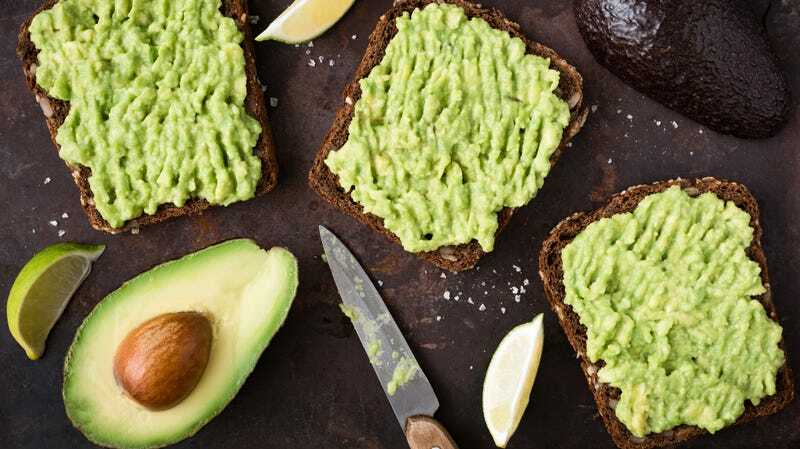 A nicely toasted, thick slice of nutty multigrain bread, some chunky-but-creamy guac spread, a little sriracha or flaked salt on top—lovely little breakfast there. Where the ire comes from, I think, is when a brunch restaurant with subway tile and those pipe light fixtures charges $18 for what is, in essence, just a piece of toast and half an avocado. That grinds our collective gears, but how do we feel about a $2.79 “breakfast avocado toast” kit from the grocery store? Sabra—which many know as “the hummus company”—recently introduced these prepackaged, some-assembly-required kits to grocery shelves. Each kit has a little packet of guacamole spread (avocados, cilantro, lime juice) plus some whole grain toast squares to spread it on. They retail at Target for less than $3. Genius, or insufferable? Let’s break down the arguments. They’re basically a guac version of Sabra’s hummus and pretzel kits, which no one seem to mind. It’s more economical than buying a giant tub of guac and an entire box of Triscuits. Avocados are hard to mash on the go. Bread is hard to toast on the go. Where is the knife for spreading? Now we’re dipping avocado toast? Avocado toast is dumb on face, ergo, to-go avocado toast kits are even more dumb. *Editor’s note: Free million-dollar idea right there, Smucker’s.